There must be some deeper message behind the post-Star Trek TV Show / pre-Star Trek Movies choices made by William Shatner, DeForest Kelley, and Leonard Nimoy. Of the three, only one of them was involved in a vaguely science-fiction project (a remake of Invasion of the Body Snatchers), while the other two went out west to be attacked by nature's wrath (giant, killer bunnies and tarantulas, erm, "spiders"). While it's true that making quasi-horror movies in the American Southwest is about as far as you can get from "space," there's a pretty good reason that Invasion of the Body Snatchers ('78) is the best remembered. Far be it from the Cap'n to say that there's nothing to enjoy about Night of the Lepus or Kingdom of the Spiders - both a perennial favorites at Fests, so much so that I brought Spiders back after a three year absence. In some ways it's a movie only William Shatner could have starred in - his cocksure attitude (and ball-hugging jeans - the streak continues!) lend a sense of gravitas to the otherwise ridiculous premise that spiders have decided we use too much pesticide and we must be destroyed. Also because their food supply has been wiped out by said pesticide, they'll kill anything else near them (cows, dogs) but not eat them. It's more a rage killing than a food thing. They're making a statement. 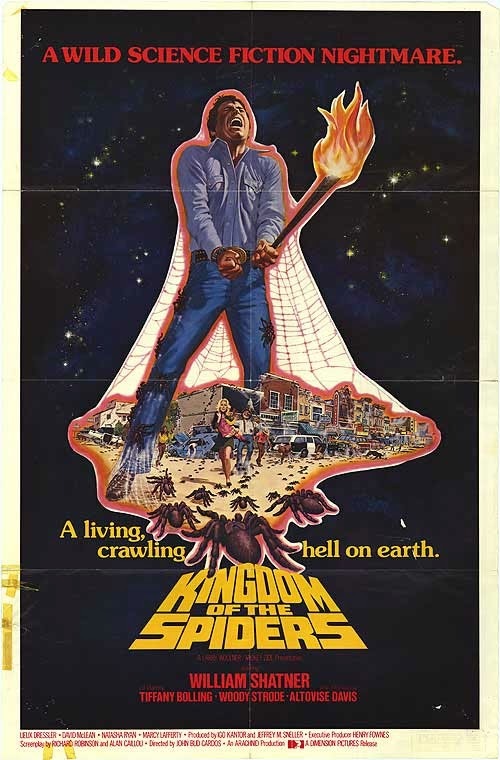 I can understand why Kingdom of the Spiders was a longtime staple of Saturday afternoon matinees on television, because it's basically as "safe" a movie about killer spiders as you can get (only Eight Legged Freaks is more tame). Aside from what appears to be a genuinely terrified actor having tarantulas dumped on him while he pretends to fly a plane and the scene where Woody Strode (Spartacus)'s wife completely misunderstands how to use a gun to fight spiders, there's no really graphic or disturbing content. Well, aside from the subplot about Rack's (yes, Shatner's character's name is Rack Hansen) sister-in-law trying to jump his bones when he comes to visit his niece. Okay, so Rack's brother is dead, but brother swapping is arguably not appropriate. But I think I covered most of this in the Horror Fest recap of Kingdom of the Spiders. This time I wanted to mention how hilarious the concept of "Spider Mounds" were to the Summer Fest crowd. Bad Science has been a running theme throughout the weekend, and I don't suspect we're done with it yet, but there's something about 70s "Nature Gone Amok" films that brings out the worst of it. And I don't just mean the most renowned veteranarian in Arizona happily drinking beer on the front porch of the Sherrif's house when entomologist Diane Ashley (Tiffany Bolling) arrives and he proceeds to gloat that she thought he was a gas station attendant when they first met. Then again, we're talking about William Shatner here, as a veterinarian, which is to say he's just playing William Shatner. And the sight of William Shatner covered in tarantulas in the basement of a motel (the first scene I ever saw from Kingdom of the Spiders) is worth the price of admission. The vaguely apocalyptic ending is pretty good, too, but I'm positive I mentioned that last time as well. Bear Force One... You know, I could tell you about it, or I could just let you watch it for yourselves. It's not very long - just long enough not to wear out its welcome, so settle in and get ready for some "what the living crapballs is happening?" See what I mean? It goes just to the brink of being "too much" but never gets boring. I enjoy a good "home made" B-movie (like last year's Rise of the Animals) more than most do, I guess. There's something to be said for a "can-do" attitude and a good sense of humor.